At New York Comic Con's Del Rey/Spectra panel, some of the imprints' most popular authors — including Naomi Novik, Scott Westerfeld, and Peter V. Brett — hinted at what to expect next. In the Temeraire universe, the Inca were not conquered because they had their own dragon aerial forces who resisted the conquistadors. They've been hanging around in the background, quietly unmentioned, but in this one I finally got a chance to go and play with them. It's the 7th book in the series, which means "we're in the downhill slope, headed towards the conclusion of the series," which will end with book 9. 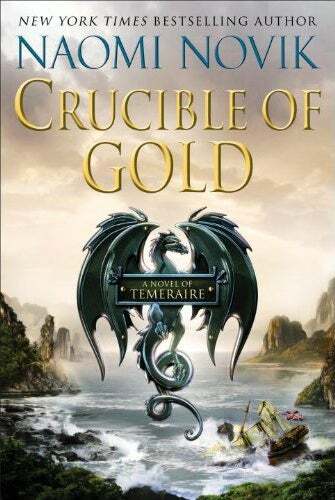 Crucible of Gold hits shelves in March 2012. The main focus character for the third book is going to be Inevra, the wife of Ahmann Jardir. She's going to get the full childhood-to-adulthood POV treatment, then it's going to sync back up with regular events. Most of Jardir's action are going to be witnessed through her or through Gavin and most of Arlen's actions are going to be witnessed either through Leesha or Renna, until the end when Jardir and Arlen meet again for the first time, which is going to be a blast. Shay's story starts six months before Tally's does.... Shay and Zane were friends were friends back when they were both Uglies and they were going to run away to the Smoke together and supposedly they chickened out. Well, that's just what they told Tally. The real story is much more complicated. But there are many codes within manga styles to create characters who are ugly versus pretty.... the Pretties are always beautifully coifed and there's always that mystical manga wind blowing their hair the right way. And for Ben Aaronovitch fans: Don't worry, the third book is coming. Editor-in-chief Betsy Mitchell called this "One of those cases where I need a 3,000-mile-long stick so I can reach across the Atlantic and bash him in London." The author had finished the manuscript but his beta readers apparently discovered a gaping plot hope — necessitating a big rewrite that pushed everything back six months. But hopefully the next book, Whispers Underground, will hit the shelves sometime in June.